Last night Perth Radiological Clinic was privileged to receive the Perkins Corporate Donor award for 2018. The award was presented to Lenka Psar-McCabe, Perth Radiological Clinic’s CEO by the new WA Governor the Hon. Kim Beazley AC in front of more than 200 guests at Government House. PRC is humbled to be named in the company of past recipients such as Wesfarmers and Woodside. 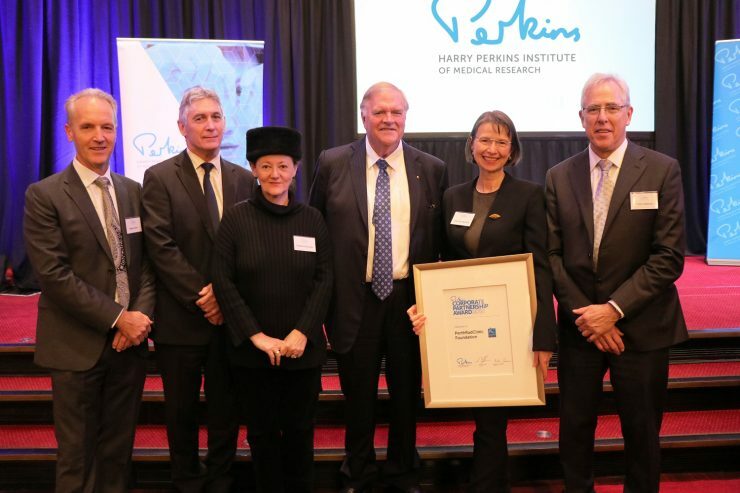 West Australia’s Harry Perkins Institute of Medical Research has grown to become one of the nation’s leading adult medical research centres, where a close knit team of more than 250 work together to defeat the major diseases that impact our community. With two state-of-the-art research facilities, co-located with the major teaching hospitals, the Perkins is creating a culture of innovation and collaboration to deliver better patient outcomes faster. Perth Radiological Clinic is pleased to support Perkins in putting world class scientists, doctors and researchers together in modern facilities, purpose built to encourage collaboration, amazing things happen. L-R: Dr Stephen Davis, Radiologist & past Chairman of PRC, Mike Hayton, CFO – PRC, Geraldine Ormonde, Senior Marketing Manager- PRC, the Honourable Kim Beazley AC. Governor of Western Australia, Lenka Psar-McCabe, CEO – PRC, Professor Peter Leedman, Director of Harry Perkins Institute of Medical Research.